Magi Gibson is well known to North-East audiences from her time as Writer-in-Residence with Aberdeenshire Council. Many North-East writers remember the writing workshops she used to run in Stonehaven with great fondness, valuing highly Magi's support, encouragement and constructive criticism. We are delighted to be able to invite her back to Stonehaven to give another workshop, and we hope to see some old familiar faces as well as new. Magi's workshops always seemed to take place on story winter's nights — we may not be able to recreate the weather, but on a March evening in Stonehaven... who knows? Please feel free to bring along a piece of your work, prose or poetry, for discussion, or just come along to enjoy the debate. Come early for food at the Station Hotel from 5.30pm. 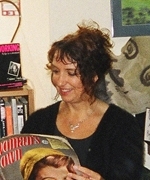 Poet and performer Magi Gibson lives in Glasgow. She has three grown-up children. She graduated from Glasgow University with a degree in French and German and taught languages until the birth of her first child. Since then she has held three Scottish Arts Council Fellowships and one Royal Literary Fund Fellowship. She has won prizes for poetry and short stories, and was recently named as Stirling's first Makar for nearly 500 years. In 2007 she was awarded a Scottish Arts Council Bursary to enable her to develop her writing for older children and teens. Her first three novels for this age group, Sassy Blu, Eco-Warrior Babe, will be published by Puffin in 2009; the first comes out on 1st April and is Waterstone's Book of the Month. Philip Astor for making Migvie Church available. Sera Irvine of Left Bank, Tarland. Huntly Writers and the Brander Library, Huntly. Roger Goodyear and Anne McArthur of the Salmon Bothy, Portsoy. Lisa Fraser, Gráinne Smith, Phyllis Goodall and Linda Smith for essential work behind the scenes. Sheena Blackhall, Gerard Rochford, Kenneth Steven, Douglas W. Gray, Magi Gibson, Ian Crockatt and Colin Will.